A special court convicted a former top aide to the ex-prime minister of a corruption charge, sentencing him to three years in jail as part of a crackdown by the interim military-backed government. Harris Chowdhury, who had served as political secretary to former Prime Minister Khaleda Zia, was accused of failing to submit a statement explaining how he had amassed wealth that did not match his legally declared income. Chowdhury was the first to be convicted by the special court, set up this month in the National Parliament building to try more than 150 high-profile corruption suspects including politicians, bureaucrats and businessmen. The suspects face charges including amassing wealth through corruption and abuse of power, and concealing information about assets. 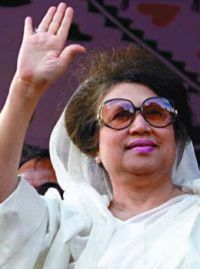 The politicians belong to the country's two main political parties, led by Zia and her longtime rival Sheikh Hasina. The interim government, led by a former central bank governor who has the backing of the country's influential military, has vowed to fight corruption, reform electoral rules and clean up the nation's factional and often violent politics before holding the next elections possibly in 2008. Bangladesh, an impoverished country of 145 million people, has been ranked as one of the world's most corrupt countries by the Berlin-based anti-corruption watchdog, Transparency International. The Anti-Corruption Commission, headed by a retired army chief, has been invistigating bank accounts and other assets belonging to public officials, senior politicians and business tycoons suspected of graft. Those whose bank accounts were checked include Hasina and Zia. During a visit Tuesday outside the capital to raise public awareness against corruption, commission chief Hasan Mashhud Chowdhury said the corrupt sectors of the country have been identified, and now was the time to arrest and punish those involved in corruption, a domestic news agency said. "We should build a social movement against corruption. We must not give anyone the chance to dub our country a 'champion in corruption' ever again," he told a meeting with civil soceity representatives at Tangail, the United News of Bangladesh said. Security forces in recent months have arrested several former lawmakers, ex-ministers and senior politicians, including Zia's son and heir apparent, Tareque Rahman. Authorities have also confiscated properties of the accused, including luxury cars and exotic pets. Zia and Hasina have dominated their country's politics for 15 years. Many Bangladeshis blame the women's feuding for worsening the country's widespread poverty. The government tried to bar Hasina from returning home while she was on a trip abroad last month, and local media reports have been speculating that it is trying to force Zia into exile overseas. The government reveresed the ban on Hasina's return and has denied that it was forcing Zia to leave the country. On Monday, Judge Ashraf Hossain convicted Chowdhury after hearing testimony from five witnesses over two weeks, public prosecutor Golam Fattah told reporters. Chowdhury, who has been on the run since the interim government took over in January, was not represented by counsel. His sentence will take effect after his arrest or surrender, Fattah said. "It was a good ruling," Fattah said after the verdict. Last month, a special court in nearby Narayanganj town sentenced a fugitive ex-lawmaker to three years in jail, in the first conviction of a politician under the recent corruption crackdown. Shamim Osman, a member of Parliament from the Awami League party in 1996-2001, was tried in absentia and convicted of failing to appear before an anti-corruption commission to submit a statement of his assets. Zia ended her five-year term in October 2006 and handed power to a caretaker administration to oversee new general elections, which were scheduled for January. But opposition parties, led by Hasina, held a series of violent street protests demanding electoral reforms. That prompted the president, who led the caretaker administration, to cancel the January elections, declare a state of emergency and appoint a new interim government.